Chronic wasting disease (CWD) is ravaging wildlife in many regions across North America. It’s now in reindeer in Scandinavia. Suffice it to say, sick deer didn’t jump the Atlantic Ocean to Norway and Finland. 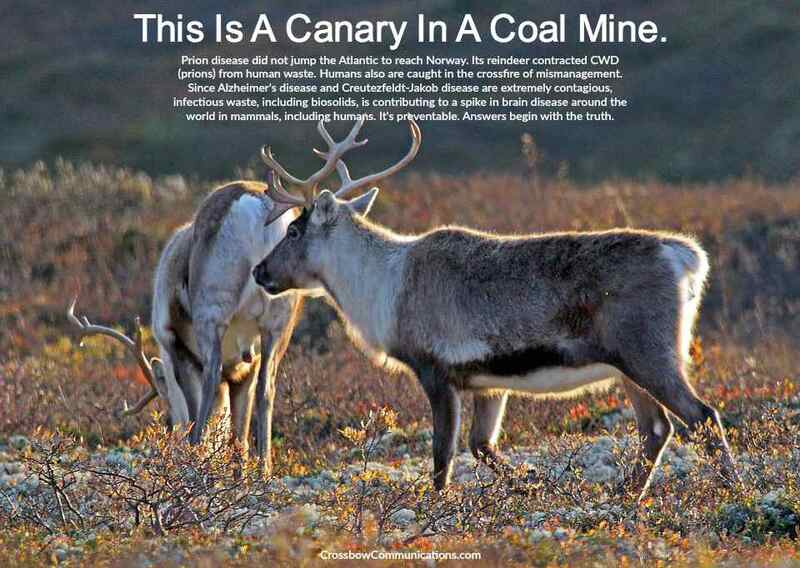 Sick wildlife are a canary in the proverbial coal mine and we should heed the warning signs. CWD is part of a larger epidemic of neurological disease that is killing people, wildlife and livestock around the world. The warning signals are being ignored. Although there are several ways for CWD to take hold and spread, the biggest prion pathway in the world is being ignored. Dr. Stanley Prusiner, an American neuroscientist from the University of California at San Francisco, earned a Nobel Prize in 1997 for discovering and characterizing prions and prion disease. President Obama awarded Prusiner the National Medal of Science in 2010 to recognize the importance of his research. Unfortunately, Prusiner’s science is being ignored and we all are facing a public health disaster because of the negligence and reckless disregard for public health. Prions are such a formidable threat that the U.S. government enacted the Bioterrorism Preparedness and Response Act of 2002, which included a provision to halt research on prions in all but two laboratories. It classified prions as select agents that pose an extreme risk to food, water and health systems. Unfortunately, the Center For Disease Control quietly took prions off the list about two years ago because the classification threatened to criminalize some multi-billion dollar industries and many industry practices. Prion disease also is known as transmissible spongiform encephalopathy (TSE). The operative word is “transmissible.” Prusiner claims that all forms of TSE are caused by infectious prions. Prion disease often is described as a wasting disease that causes a loss of body mass and brain mass. In humans, the prion spectrum includes Alzheimer’s disease, Parkinson’s disease and an extremely aggressive version known as Creutzfeldt-Jakob disease. The difference between these diseases is very slight and often indistinguishable to neurologists. For example, millions of people have the severe form of Alzheimer’s disease, which is known as Creutzfeldt-Jakob disease (CJD). CJD is clearly a prion disease. According to neuroscientists Dr. Laura Manuelidis, at least 25 percent of Alzheimer’s diagnoses are actually CJD, which is further up the prion spectrum. CJD, without dispute, is extremely infectious to caregivers and loved ones, but it has not been declared a reportable disease across the U.S. and many other nations. 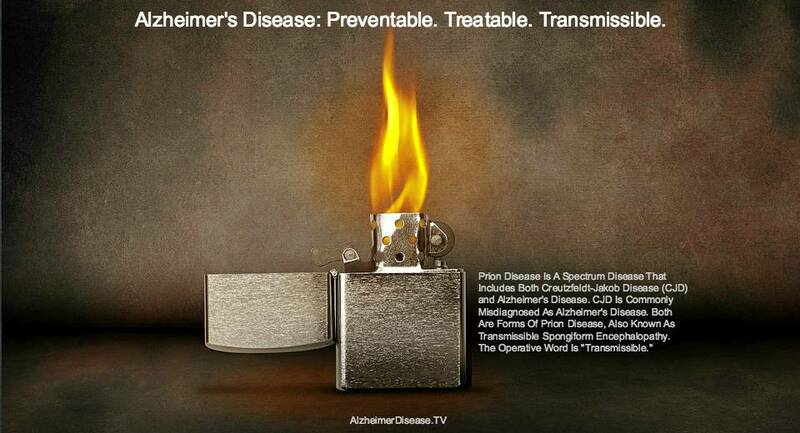 Millions of cases of deadly CJD are being misdiagnosed as Alzheimer’s disease. Millions of patients and caregivers are being misinformed, misguided and exposed to an aggressive prion disease. Millions of people with prion disease have exposed us all to their infectious waste thanks to misinformation, mismanagement and negligence. Meanwhile, chronic traumatic encephalopathy (CTE) is likely a form of transmissible spongiform encephalopathy—prion disease. In most of these cases, the trauma was the change agent that caused prions to misfold and become toxic. Once the neurodegeneration of CTE begins, are these victims shedding infectious prions? Hopefully, prion researchers will fill in this very important blank. Again, families and caregivers need to know if they are dealing with a TSE. Misinformed caregivers, family members, healthcare workers and others are caught in the crossfire of a deadly form of protein. In fact, few family members are warned about the infectious nature of CJD. Meanwhile, hospitals throw out surgical instruments used on such patients. Neurologists prefer not to touch or even be in the same room as a patient with CJD. The CJD Foundation and other advocacy organizations also remain mum on the risk of transmission. The CDC remains silent. Is this cone of silence at all levels incompetence, negligence or criminal misconduct? Abnormal proteins also are associated with autism. In fact, it appears that age is the biggest difference between the neurodegenerative disease spectrum and autism spectrum disorders. Both spectrums share common environmental causes and pathologies. Plus, CJD is taking the lives of more and more young adults and adolescents. Prion disease is highly contagious, incurable and fatal. Despite all of the smoke and mirrors, prion disease is prion disease. It’s killing more and more mammals, including humans, every year. CJD victims should be quarantined because prions are in the skin, urine, feces, blood, saliva, mucus, skin and cell tissue of all victims–all human byproducts that are washed, dumped, or flushed down sinks and toilets. 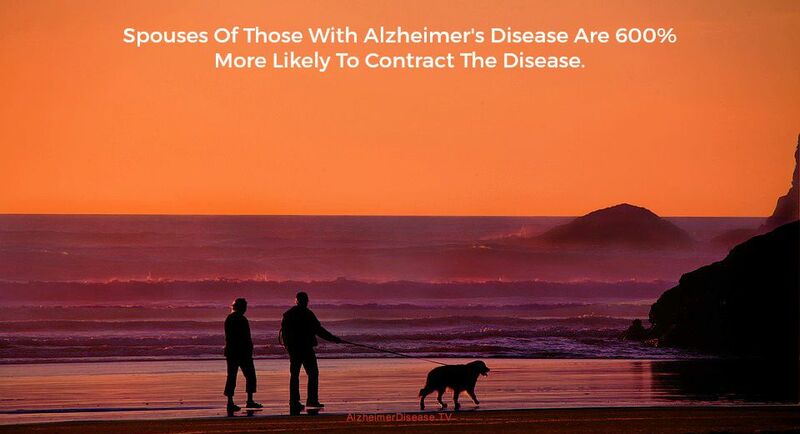 Alzheimer’s patients also should be handled with care.One can assume that the waste is extra infectious when it comes from funeral homes, nursing homes, hospitals, dental offices, veterinarians, slaughterhouses and some laboratories. In other mammals, it’s called different things, but prion disease has been found in dolphins, elephants, mink, cats and many other species. The suggestion of a reliable species barrier against thousands, if not millions of mutations is ludicrous. Prion disease causes memory loss, impaired coordination, and abnormal movements. Prion disease is incurable and fatal. Is it transmissible? A new study published in the journal Nature renews concern about the transmissibility of Alzheimer’s disease between people. A second study by the same scientist in early 2016 adds to the stack of evidence. Wastewater treatment plants are collecting points for prions from infected humans. The sewage treatment process can’t stop them, but they can serve as prion incubators and distributors. Not only are homes and hospitals exposed to the prion pathogen, so are entire sewage treatment systems and their by-products. Wastewater treatment plants are prion incubators and distributors. 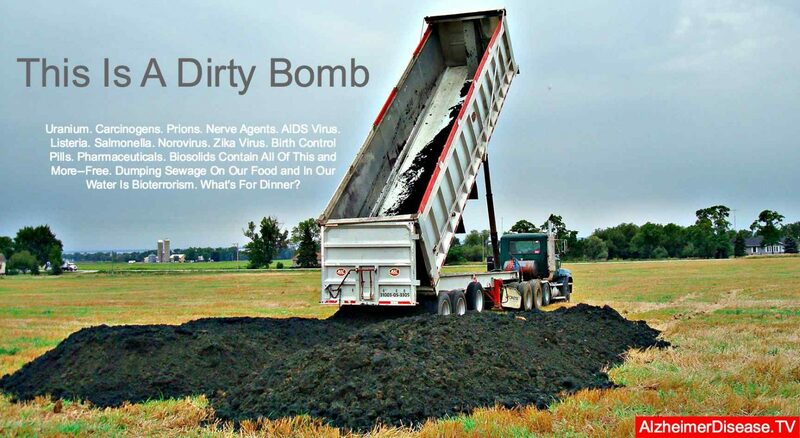 The sewage sludge and wastewater released are spreading disease far and wide. Thanks to sewage mismanagement, prion diseases are killing humans, wildlife and livestock around the world today. As more and more people are contracting TSEs, sewage systems are more contaminated with prions than ever. 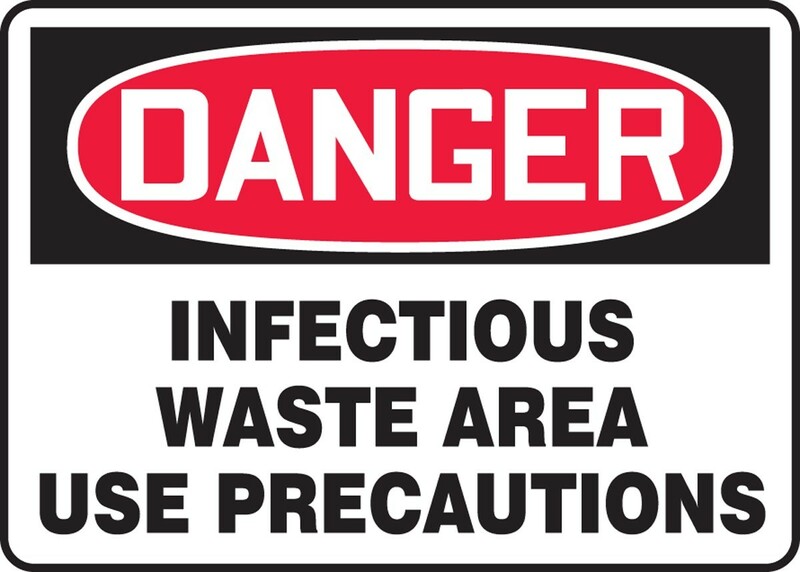 Infectious waste is becoming more infectious every day. “Since it’s unlikely that the sewage treatment process can effectively neutralize prions, adopting measures to prevent the entry of prions into the sewer system is advisable,” said the Toronto Department of Health, November 2004. Exposing crops and livestock to prions is a very bad idea. Plants absorb prions from the soil along with water and nutrient uptake, which makes the prions bioavailable and infectious to humans, wildlife and livestock via the food chain. The problem with prions is that they linger in the environment infinitely because they defy all attempts at sterilization and inactivation. Unlike viruses or bacteria, prions are not alive. Therefore, they can’t be killed. When the U.S. government enacted the Bioterrorism Preparedness and Response Act of 2002, it included a provision to halt research on prions in all but two laboratories. It classified prions as select agents that pose an extreme risk to food, water and more. It was a step in the right direction. Unfortunately, industry pressure convinced the Center For Disease Control to quietly take prions off the list of special agents two years ago. Keeping prions listed threatened to outlaw several multi-billion dollar industries. This reversal kept the floodgates open to the prion threat, especially regarding sewage, agriculture and water reclamation industries. These reckless policies also are contributing to the simultaneous surge in autism across the United States. Although there are many causes and pathways contributing to CWD and the prion disease epidemic, many pathways are being mismanaged around the globe. Thanks to sewage, biosolids, reclaimed sewage water and feedlot waste, we’re recycling the prion pathogen that causes neurological disease right back into our watersheds, which we share with deer, elk, moose, livestock and other creatures that are vulnerable to prion disease. Rain, wind and irrigation spread deadly prions further everyday. Healthy wildlife are being exposed to deadly prions and other toxins through food, water, air and contact with infected animals. Every sewage system in the world has been used by a person, if not millions of people, with Alzheimer’s disease and Creutzfeldt-Jakob disease. Sewage systems have become prion incubators. Biosolids, water reuse and sludge disposal have made them potent prion distributors. The waste from feedlots is likely contributing to the epidemic. Prions spread uncontrollably and contaminate everything that they touch—much like radiation. Unlike radiation, however, prions do not deplete themselves. They migrate, mutate, multiply and kill with unparalleled efficiency. Each victim becomes an incubator and a distributor of the Pandora-like pathogen. Although there are multiple causes of prion disease, including CWD, reckless policies are contributing to an environmental nightmare. Sick deer, elk, moose and other wildlife and marine life are just a symptom of a much bigger problem. Putting these pandora-like pathogens back in the box is impossible. Injecting them into the lifecycle is reckless and a form of bioterrorism. Unfortunately, misinformation distributed by government agencies about the risks associated with chronic wasting disease are reckless, incompetent and criminally negligent at best. Claiming that there is no known risk associated with handling or consuming wildlife with CWD is laughable. Claiming that game processing facilities aren’t spreading the disease from infected carcasses to healthy ones is a joke. Just look at the guidance issued regarding mad cow disease. Just look at the guidance issued to people with the most severe form of the disease–Creutzfeldt-Jakob disease. The bodies of prion victims, regardless of species, are highly toxic and contagious. Hunting knives and saws used on sick wildlife are infected forever. Processing plants that cut and grind wildlife carcasses for hunters (before CWD tests are complete) are contaminated forever. Every animal processed after an infected carcass will become infected. It’s insane to think that game processing plants are prion-free. Regulations in this arena are criminal. Thousands, possibly millions, of innocent people have been exposed to the prions from someone else’s sick deer. That’s because many are processed before testing or no testing is done at all. Pickups and trailers that transport infected animals are hopelessly contaminated. The prion pathways created by one hunting trip can explode exponentially within hours. If it’s impossible to stop prions in an operating room, it’s impossible to stop them in the challenging environment of a high-volume, low-tech wastewater treatment facility. 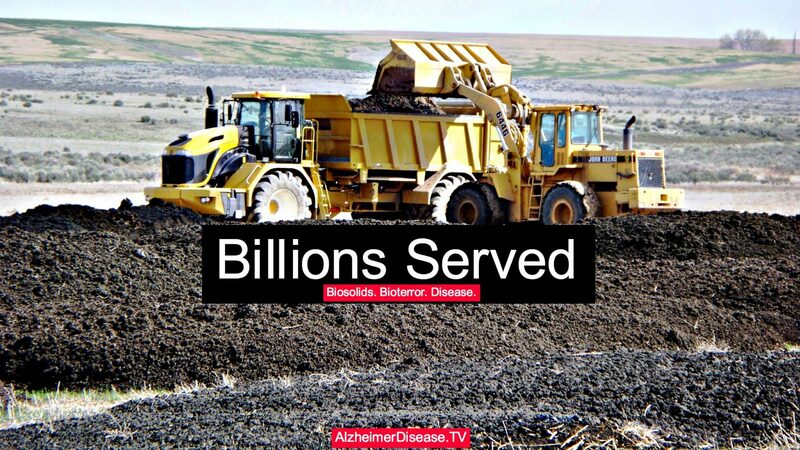 It’s ludicrous to think that treated sewage water or biosolids are prion-free. Especially since prions from people are much more infectious than those found in other species (prions become more aggressive as they work their way up the food chain). The TSE epidemic represents an environmental nightmare that threatens every mammal on Earth. Sewage mismanagement also is contributing to the global autism epidemic. The timing of the surge in these brain diseases follows the same timing and trajectory. Chronic wasting disease is now rampant in Canada and it recently jumped the Atlantic to Norway’s reindeer herd. It’s spreading across the U.S. like wildfire as we spread more pathogens and lies. Land application sites often involve locations where poverty is high and economic prosperity is low, which means resistance is low. Sludge tends to be dumped where minorities live, leading to allegations of environmental racism. Unfortunately, contaminated food and water make it back to the cities where the infectious waste originated. Thanks for your great work and advocacy. Hopefully, we can help reform misguided sewage practices and policies before the floodgates are open much longer. Biosolids and other forms of mismanaged sewage are bioterrorism–threatening our food, water and more. Of course, prions aren’t the only pathogen in sewage, but they are my poster-child for the entire pile of BS thrown at us by industry and government. The body count is stacking up around the world. You make shocking claims without citing sources. I am a newspaper columnist. Can you point me in the right direction to ding some peer-reviewed scientific journal articles on this topic?